Growing up in Medellín, Colombia, in the 1980s, artist Camilo Restrepo is all too familiar with the ravages of the drug war. There were the regular car bombs planted by the henchmen of cartel leader Pablo Escobar. There was the dead man in front of his house — the victim of a hit — covered up by a bright yellow blanket, one that had come from Restrepo’s own home. And there was the corpse left in the middle of the street, when Restrepo was just 5 years old. In his work, Restrepo has long explored questions of violence — specifically in ways that connect to the drug trade — but not in ways that you might expect. His sprawling, hyper-detailed drawings, some of which extend to wall-size, are cartoonish phantasmagorias of all kinds of aggression: maniacally grinning animated characters, silhouettes pricked by dagger-shaped forms, loose body parts gripping and grappling pieces of grotesque machinery — all of it woven together by a thick web of veins. In fact, the artworks’ central images are various fighters — the Thing, Mike Tyson, the Hulk, Glass Joe (from the Nintendo game “Punch Out! !”) — all surrounded by Restrepo’s familiar web of insanity: politicians, puppets and cartoons all unleashing mayhem. The figures are all bound to one another by strands of tightrope. Restrepo was born and raised in Medellín, the son of middle-class parents who studied mechanical engineering in college. But a journey all around Latin America turned him onto the idea of becoming an artist. The job, however, allowed him free time in which to work on his own art, one that initially focused on the paraphernalia related to the drug trade. (He would take pictures of pipes and other objects related to distribution and consumption.) His early work led to some success: Restrepo showed his art in galleries and was nominated for the Premio Luis Caballero, a prestigious Colombian award. Even so, in his late thirties, he decided he needed to take an artistic leap and enrolled in the MFA program at the California Institute of the Arts — a move that he says “totally changed my practice and my life.” It was while he was at CalArts that his anxiety disorder would be formally diagnosed and treated. But it took time for him to bring meaning to the drawings. By his third semester at CalArts, Restrepo had given up photography and other types of work to focus exclusively on drawing. It has been his chosen medium ever since. And yet to label Restrepo’s work “drawing” doesn’t get at the half of it. With simple sheets of paper, he achieves almost three-dimensional effects. He’ll crumple and scrape the sheets until the paper achieves the looseness of fabric. He attacks the surface with ball-point pens. He’ll add a layer of color, then rub it off with saliva. To the surface he adds tape and bits of newspaper, among other elements. Look at his works from a distance and you will see the graphic outlines of a central figure with a colorful backdrop. Get in close and you will see layers of lines, text, color, texture and materials. Turner, who has worked with Restrepo since 2013, says the artist has a truly physical relationship to his material. A large-scale work he showed at Turner in January, titled “Bowling for Medellín 1,” started off as a rubbing he made from the patch of Medellín sidewalk he was standing on when he found out that the notorious Escobar had been killed. To this, he added his signature layers of scrapings, cuts, tears, collage and wild drawings (including a depiction of Escobar). It’s bright red-and-yellow color palette makes the piece appear lively and bright from a distance. But the beaten texture of the paper reveals the artist’s aggressive methods. And, of course, there’s the content. 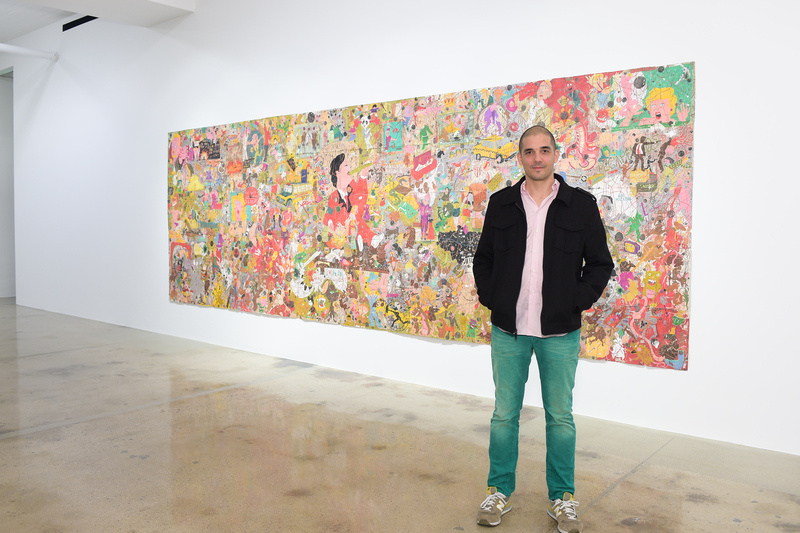 The cartoon-y nature of his work is quite intentional — capturing that intersection between violence and popular culture. Part of it comes from the childish nicknames that drug traffickers often give themselves — from “Felix El Gato” (Felix the Cat) to “Beto y Enrique” (Bert and Ernie). Some of the inspiration comes from his own life, of being a young boy dressed as a superhero, peering at a dead body. It is a marriage of visual and spoken language that, with the “Tightrope” series, he has adapted to his own struggles. And one he will continue to experiment with in other ways. Not that there isn’t room for positivity. His drawings contain frequent references to Wonder Woman — a stand-in for his girlfriend. “Camilo Restrepo: Tight Rope” is on view at Steve Turner through Oct. 8. 6830 Santa Monica Blvd., Hollywood, steveturner.la.